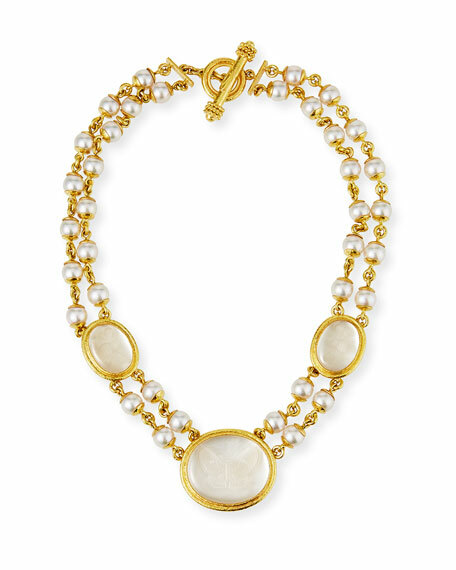 Each Elizabeth Locke necklace is handmade, link-by-link, by a single goldsmith, and can take up to ten days to complete. The toggles are stamped with the same distinctive logo that Elizabeth has used to sign letters since she was ten years old. Elizabeth Locke "Moth and Butterfly" rock crystal intaglio necklace. Signature hand-hammered 19-karat yellow gold. Japanese Akoya cultured pearls, 8mm. For in-store inquiries, use sku #1850830.